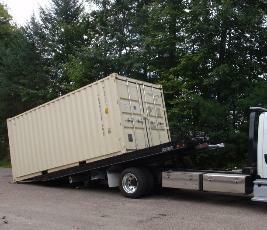 We have experience in a variety of container delivery methods. Most commonly we use tilt-tray trucks,. Please ask our experienced staff if you need further information about delivery of your storage container. What do I need to do to prepare the site where the container will go? across so long as all 4 corners are supported. air to circulate under the container and provides inspection points for pest control. We recommend 100mm off the ground – a 2.4m treated pine sleeper cut into 8 x 30cm lengths will provide 2 blocks for each corner. Additional blocks or pavers can be used to level the container. We do not recommend using more than 200mm of blocks. What type of padlock should I use? curve of the shackle when closed needs to be 38mm (1.5 inches). which protects the shackle from cutting when closed. We do not sell padlocks – your local hardware store or locksmith will be able to supply these. Quality containers on your site.